Hans-Detlef Feddersen sent me a copy of a little picture book celebrating the 25th anniversary of Bürger-Windpark Lübke-Koog. 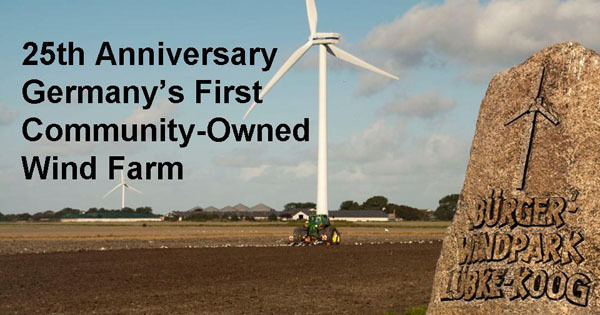 He included a DVD video of interviews with the founders of the community-owned wind farm, the first of its kind in Germany and model for the thousands of projects to come. I’ve written about Feddersen before and he’s featured in my new book Wind Energy for the Rest of Us. He and his fellow residents of the Koog or polder in the northwest corner of Germany near the Danish border were pioneers in developing their locally-owned wind power plant. They live and breathe wind energy and renewable energy in general. It’s not just that they use wind turbines and solar panels that are part of their daily life but why they do so that has had such a profound effect on the bottom-up movement for renewable energy in Germany. To the residents of the polder, as articulately expressed by Feddersen, the sun and the wind are their resource and if anybody is going to profit from these resources, it should be the residents of the polder. For the farmers of Friedrich-Wilhelm-Lübke-Koog using the wind and the sun is no different than farming any other crop. They live with and accept the changes that this crop brings to the landscape because it is theirs. Thus the book and especially the DVD are touching reminders that renewable energy is not solely about machines, it is also about people. The DVD shows the original participants sitting around a table—a kaffee klatch—discussing why they did it, kidding each other about their foibles and the problems they encountered and how they overcame them. The DVD shows the participant’s years ago building their then risky project and their much grayer and older selves today. As in neighboring Denmark, it was the people that made wind energy work. The Koog’s little book and DVD celebrate what they accomplished together. Paul Gipe is the author of Wind Energy for the Rest of Us: A Comprehensive Guide to Wind Power and How to Use It.